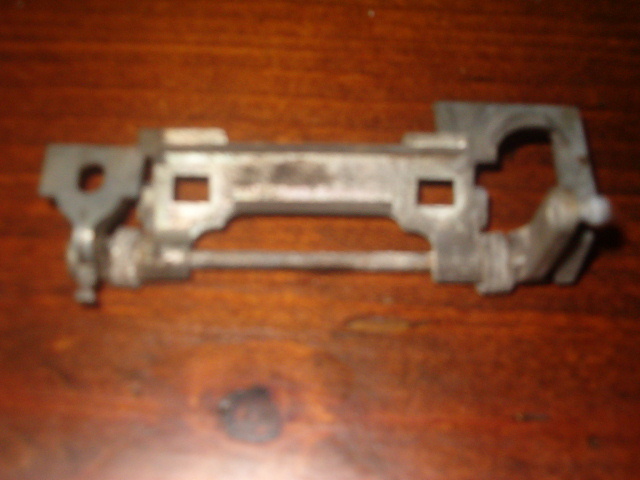 The drivers door exterior handle on my 1991 928S4 abruptly stopped working. When I pull on the exterior handle, it does not release the door latch to open the door. The interior handle still works fine. Before I begin tearing into the door does anyone have experience with this problem and potential fix? Yep - a common fault I am told - mine did it after about a month of ownership! 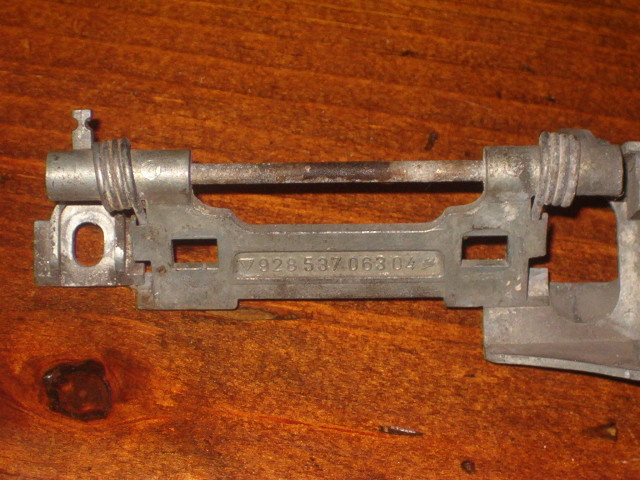 The hinge is a forged metal part, and it snaps. I got an original from stock for about $100NZ. Part # 928 537 063(4) 04 depending on left/right. 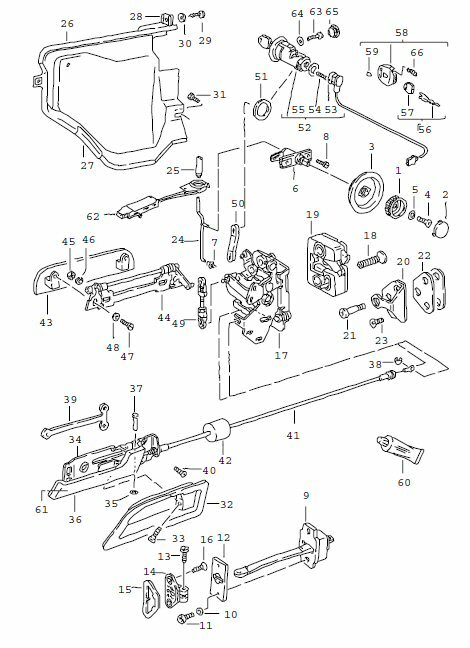 I also followed the factory manual on how to get the door panels off - the bit I had the most trouble with is taking the cap off the knob below the lock stub - there is a cap that covers a screw (#1 & #2 - I should have looked at that diagram!). Well, that and having chubby hands didn't help! Yup, same forged part was broken on my 81 Euro. if your doing this yourself put some tape on the outside door handle to hold it in position, this helps in refitment. Also you need to remove the anti theft guard first. Window up, remove the 2 phillips screws and loosen the 13,mm bolt inside door. Window down, then remove the cover, the rest will be obvious. Thanks to all for the great info. Does anyone have the tips on removing the inside door panel to get to the guts of the issue? Mine failed once too. What I remember is that having small hands helps. I was about to grab one of the little kids in the neighborhood and pay him a couple of dollars to fit his tiny hands into the door and thread the nut onto the bolt, but I managed with a pair of needle nose pliers. I have long fingers, and a trip to Bass Pro Shop gained me a pair of pliers designed to remove the hook from the back of the throat of a great lakes pike, or a bowfin or alligator gar from south Florida. The inside door panel is easy to remove, but you might break some of the plastic "keepers" that hold it on. No matter. Just remove the bolts from inside the door pocket, remove the bolt from the air-hole near the dashboard, and lift off the arm rest. Then use a small screwdriver to pry off the cap on the door lock knob, remove the screw, pull off the knob, and then unscrew the whole round assembly, using a spread pair of needle-nose pliers. Then you need to remove a TINY philips screw under the interior door latch. When you remove the arm rest, you will need to remove three wires from the mirror control. Make sure you mark down on a piece of paper where they came from. Once you've done that, use a large flat blade screwdriver to gently pry the wooden door panel from the metal door. Start at the bottom, and work your way along the sides and then lift away and upwards from the window channel. It would be good to remove the connectors from the speakers befor you try this. Again, you might break a few of the keepers in the process, but if you are worried about it you can buy new ones at the auto parts store. Reassembly is just the reverse. Good luck- Fixing this broken door handle is one of the more difficult repairs on the 928, but it is a right of passage. Last edited by Normy; 07-10-2009 at 04:22 PM..
Yup, Normy is right. Those nuts in there are very very hard to get to. No alcohol or too much coffee on this job. You need lots of patience. They must have hired ET, since your fingers will need to be that long and skinny. Normy is right, replacing that handle is a B****. I left the theft guard off on reassembly because it gets in the way and makes for a terrible headache having to get to all the tiny nuts with that big bulky thing in the way. You will need lots of patience. Also, don't be surprised if the interior handle you order does not match up exactly- I had to do some grinding in order to get the replacement to fit into place. I thought changing out the brake booster was a pain, but the interior handle takes the cake, by far. thats cake no cupcake there, a tuffie ---- i have extras unassembled driverside, have pass think that one still on salvage car though but anyone going to be needing to do the job can have for cheap. all good functioning parts,hardware. MpDano- Looks like we were thinking on the same lines but you beat me to the post. Not trying to be a copycat here. 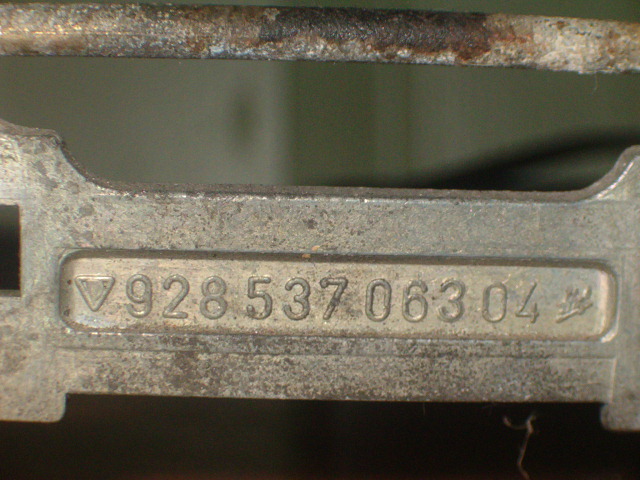 When you replaced your handle on your '81 Euro did you have to do any modifying to it? The replacement I was sent had an extra box-looking thing welded to it that ended up having to hacksaw off and then grind down. I can't remember if I bought used or new from 928 Intl, but I never altered anything on the assembly. Although a lot of other parts on my 928 has been altered in some way or another. I too left the anti theft piece off as it was hard to take off and I am sure harder to put back on. yep....R #2 just replaced Dad's door mechanism today. it helps to have teen-sized hands to do this job. Absence of Evidence, is not Evidence of Absence. Bill Maher 8/4/09--- "I'll show you Obama's birth certificate, when you show me Sarah Palin's high school diploma." part number 7 and 49 rubber (split,cracking) make sure is good heres pic of handle, had a baggy of all of the mechanism cant find, have just the handle if you want it. Last edited by lfausty; 07-13-2009 at 11:32 AM..